Home / Editor's Choice, Entertainment News / RUTO has donated Ksh 108 Million out of his own packet in harambees in 2018 so far as Kenyans question the source of his money. RUTO has donated Ksh 108 Million out of his own packet in harambees in 2018 so far as Kenyans question the source of his money. Friday, September 7, 2018 - Deputy President William Ruto has donated about Ksh 108 million in different harambees that he has been attending across the Country this year. A website named corruption tracker here>>>> has listed the donations that Ruto has made out of his pocket and questioned where he is getting all that money from. Ruto has been quoted in the media saying all the money he dishes out in harambees comes out of his own pocket. With a monthly salary of about Ksh 1 million, Ruto should explain where he is getting all this money to splash around from. 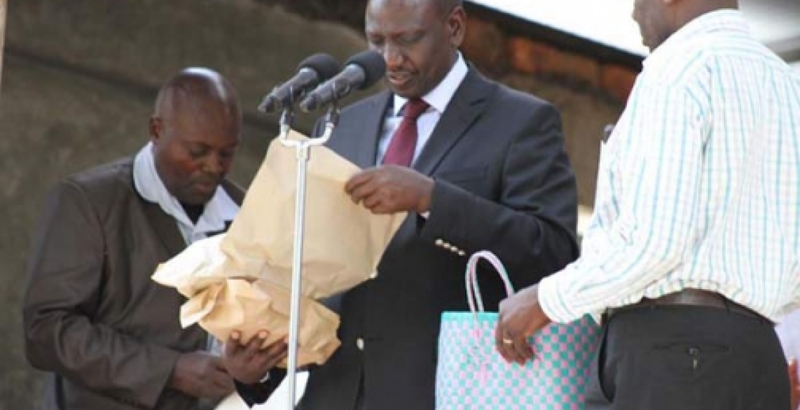 Just recently, he carried Ksh 10million in a bag during a goat auctioning event in Kajiado where he was the chief guest and bought 1, 400 goats. Here’s a list of Ruto’s donations in harambees in 2018 that amount to Ksh 108 Million.